Remember the time you stayed late at the office because your PowerPoint deck refused to leave your Outbox? Click send…and send again and say a prayer and send again… but it kept failing!! The large file size made it impossible for the file to be sent on time ‘and’ you missed the deadline. 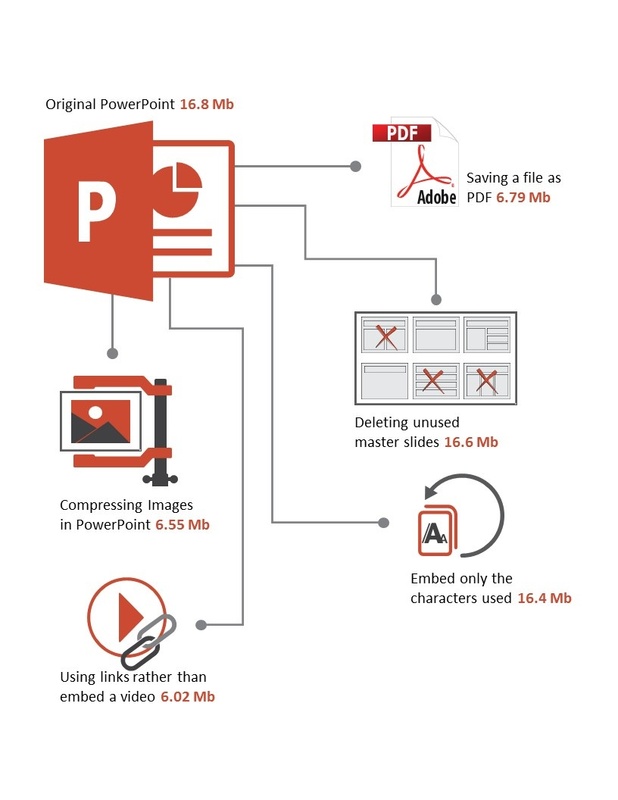 PowerPoint file size issues can be completely frustrating and unnerving. Adding that rocking motion graphic video or that the image will give your deck a great visual appeal but it definitely piles up all those extra bytes into the deck. Here are a few easy hacks to rescue you from PowerPoint file size nightmares. Look at the magic these simple tricks can do to an original PowerPoint deck of 16.8MB. PowerPoint experts at Chillibreeze swear by this trick. And it has never failed us. A high resolution picture is bound to be of a large size. This makes your deck heavy and it takes forever to upload or send as an attachment. An easy way to solve this problem would be by compressing your images. As you can see in the example, the file size decreased from 16.8MB to 6.55Mb. Master slides tend to add weight to a file. Deleting unused master slides, brings down the file size. It does not give drastic results as compressing an image but it does trim down the size a little. As seen here, the size went down by only 0.02MB. This is a good way to decrease the size of the file. As shown in the example, the size dropped from 16.8MB to 6.79MB. The file size has been trimmed drastically. But apply this only if the recipient of the deck does not need to edit it. PDF version can only be viewed. Sometimes, your client might want to use fonts that she might not have. And most often it is for one-time use, or just to present it at a meeting or conference. We know that if we embed the font, the file size will increase. So what is the fix? Luckily, Microsoft PowerPoint does provide an option where you can choose to embed only the characters used in the presentation. This option can be selected from the Save tab and definitely helps reduce the file size. However, your client can only view but not edit the font. Oh…and it can be deleted when she no longer needs it. This is a good tip for files with video or excel workbooks. Instead of embedding your videos or spreadsheets, you could just paste the link. As you can see, in the example mentioned the size dropped huge number from 16.8MB to only a 6.02MB. Go on…apply these little tricks to save your day and deadline. No more blank stares at the computer screen waiting for the file to upload or leave your mailbox.